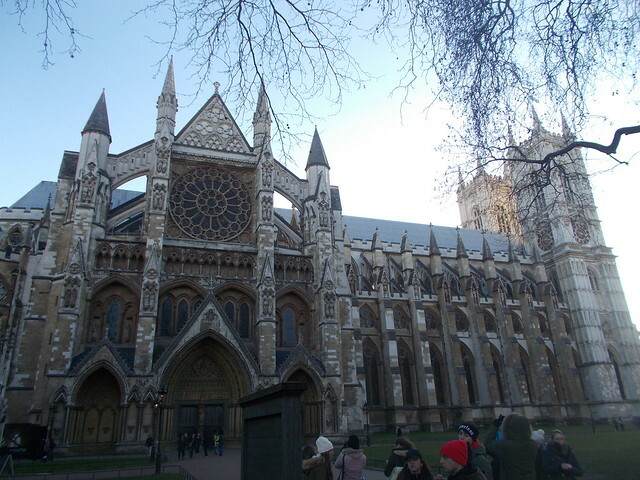 I had been to London twice before, in 2000 and 2003. In fact, I chose my study abroad program in Toledo, Spain because I wanted to return to the U.K. capital of 8,787,000 people. 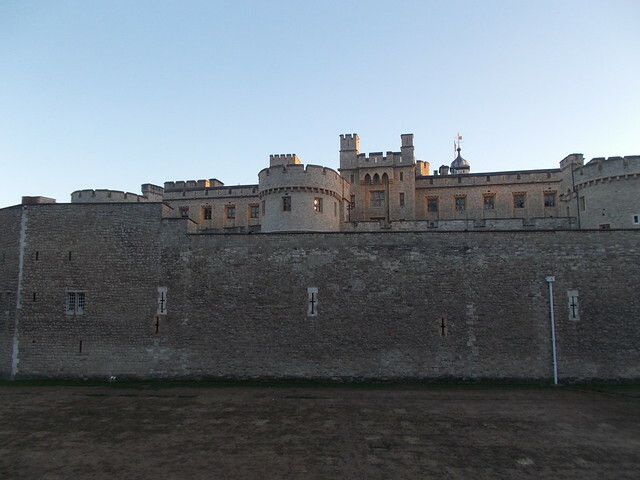 During my autumn holiday trip to London, I was so homesick for Spain that I didn’t enjoy my time there and I haven’t been back since. Había estado en Londres dos veces antes, en 2000 y 2003. De hecho, elegí el programa de estudiar en extranjero de Toledo, España porque quería volver a la capital del Reino Unido, población 8.787.000 millones de personas. Durante mis vacaciones del otoño a Londres, echaba de menos España tanto que no lo disfruté mucho y no he vuelto desde entonces. 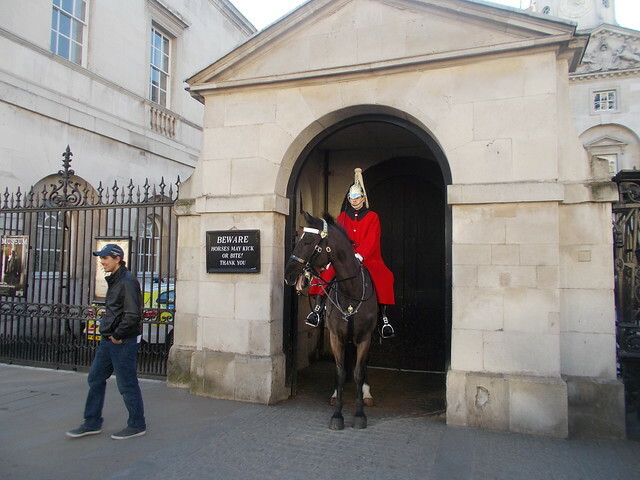 When a chance to travel to chaperone the school trip to London fell into my lap, I jumped on it immediately. I won’t write about any of my students here, of course, but I will write about what we did and saw. Cuando el instituto de secundaria donde trabajo me ofreció la oportunidad de viajar con los alumnos a Londres, lo acepté sin pensar. Desde luego, no voy a escribir sobre los alumnos aquí, pero sí, escribo sobre que hemos visto y que hemos hecho. We arrived Saturday afternoon to London Luton and had a coach waiting for us to take us to our hotel, the Royal National. We dropped off our luggage and hit the road to explore. 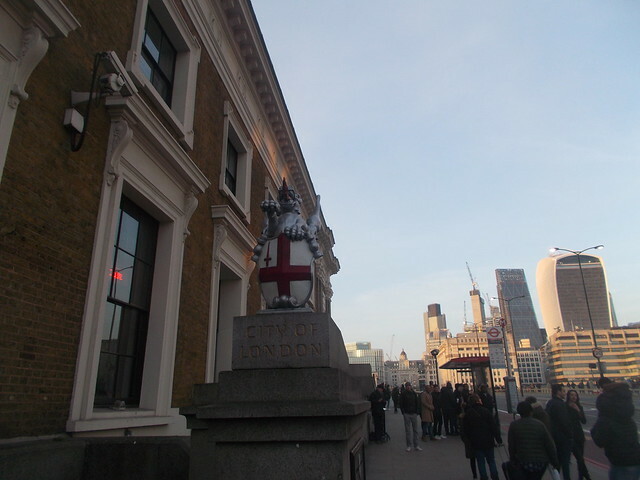 After buying Oyster passes for the Underground, which would enable us to pay as we went, we stopped at London Bridge. 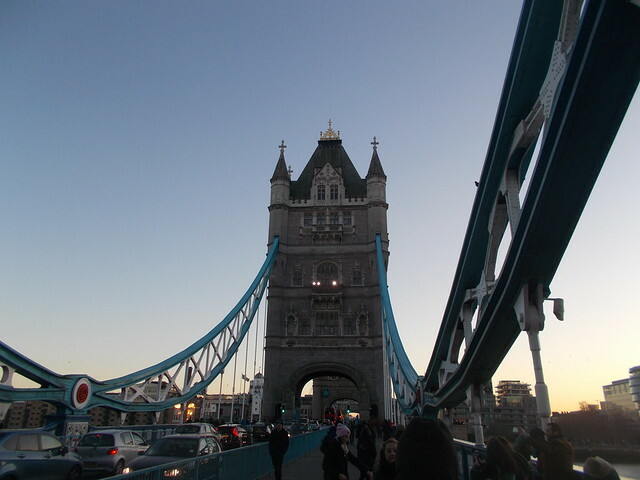 We crossed the bridge, which fortunately was not falling down, admired the Tower Bridge and walked quickly toward Tate Modern to see the views from the 10th floor at sunset. We didn’t have much time as Globe Theatre was waiting for us. Llegamos el sábado por la tarde al aeropuerto de London-Luton y había un autóbus (guagua) esperándonos para llevarnos al hotel, el Royal National. Hicimos check-in y dejamos el equipaje. Después de comprar la tarjeta de Oyster para el Underground (el metro de Londres), que nos deja pagar como viajamos, paramos en el Puente de Londres (London Bridge). 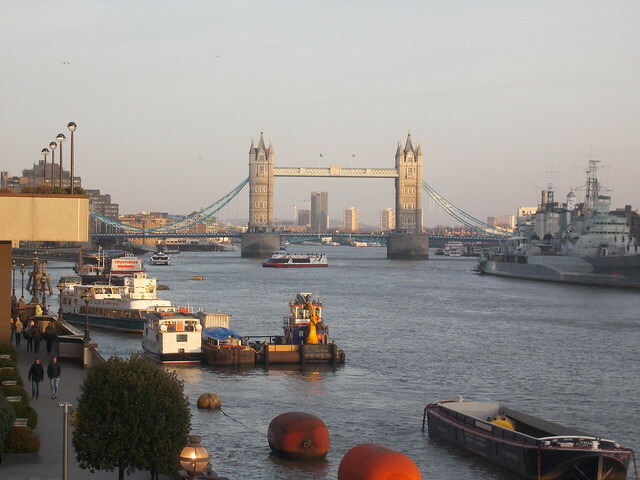 Cruzamos el puente, que afortunadamente no estaba cayéndose, admiramos el Tower Bridge (Puente Torre) y caminos con prisa hacía el Tate Modern para disfrutar las vistas desde el 10º piso al atardecer. No había mucho tiempo porque el Globe Theatre (Teatro Globo) de Shakespeare estaba esperándonos. 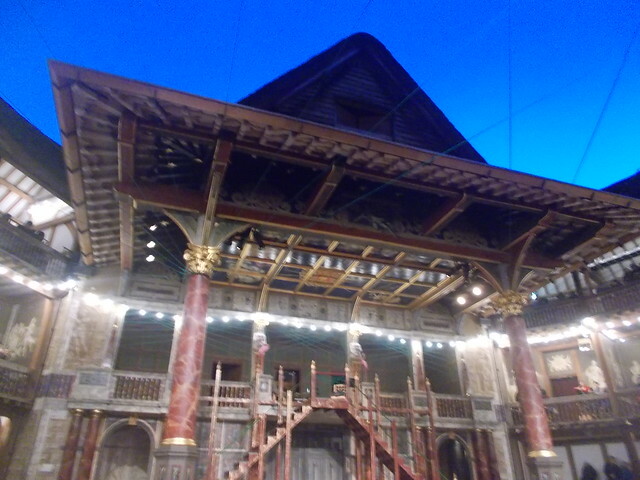 It was an awesome experience to see Much Ado About Nothing in the new Globe Theatre, although I don’t know if Shakespeare himself would have liked the singing and the dancing. I think he would have appreciated it though, as it was a great modern version of his work. We then went back to the hotel for dinner. Era una experiencia increíble ver Mucho Ado About Nothing en el nuevo Globe Theatre, aunque no sé si a Shakespeare le habría gustado sus canciones y bailes. Pero bueno, creo que lo habría apreciado como era una adaptación genial de su obra. Después, volvimos al hotel para cenar. I’m not a fan of British food, nor am I a big foodie, so we’ll leave it at that. No me gusta la comida británica, no soy un foodie, entonces…sin más. 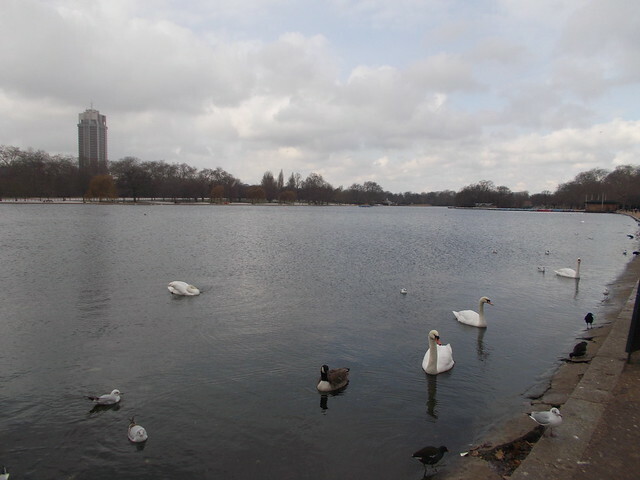 On Sunday we had breakfast at 7:30 before catching the Tube to Camden Town. We waited for the shops and market to open and enjoyed our time. 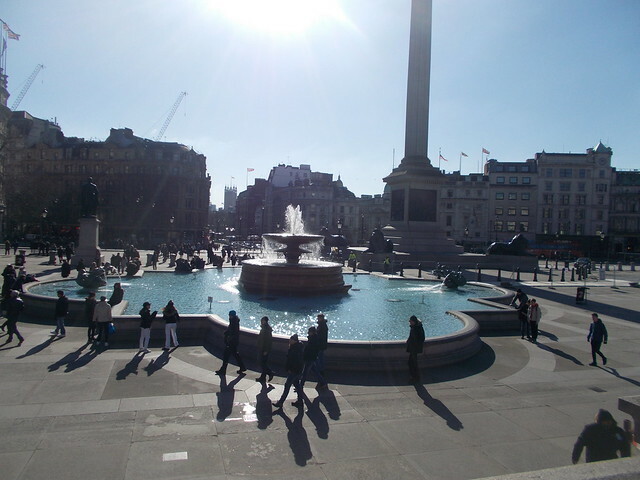 At 11:30 we caught the Tube again to Trafalgar Square, where we later toured the National Gallery before lunch. Domingo, desayunamos a las 7:30 antes de coger el Tube (otra palabra por el Metro de Londres) hasta Camden Town. 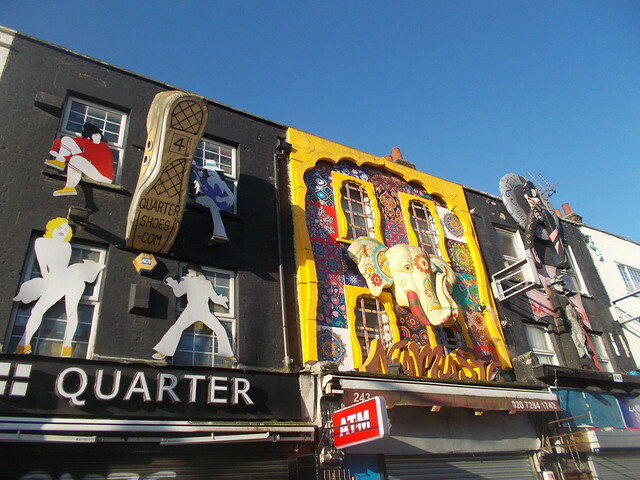 Teníamos que esperar hasta que las tiendas y el mercado abrieron y disfrutamos de ver Camden. 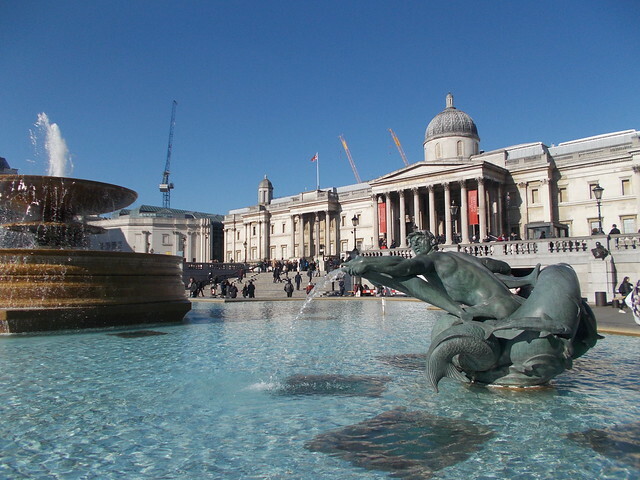 A las 11:30 cogemos el metro otra vez hasta Trafalgar Square, donde visitamos el National Gallery (Galeria Nacional) antes de comer. 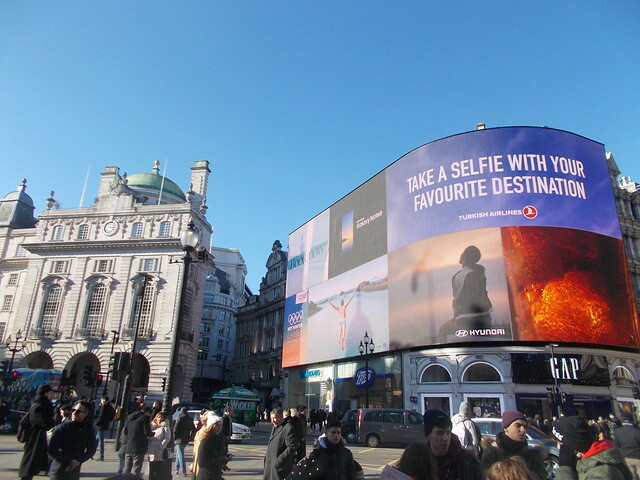 After lunch was a walking tour that included Chinatown, Piccadilly Circus, 10 Downing Street, the Houses of Parliament, Westminster Abbey and the London Eye. 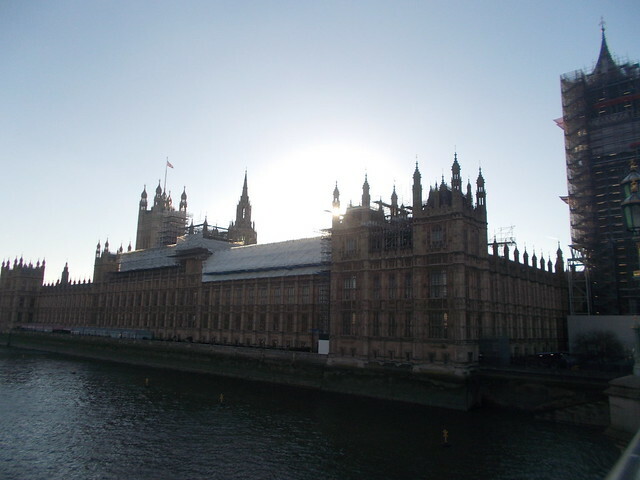 Unfortunately, Big Ben was covered by scaffolding as the famous clock was undergoing restoration. The works are scheduled to be completed in 2021. Después de comer era un guia caminando por los sitios más conocidos de Londres que incluye ChinaTown, Picadilly Circus, 10 Downing Street, las Casas de Parlamento, Westminster Abbey y la noria de London Eye. Lamentablemente, el reloj famoso de Big Ben estaba escondido por los andamios de las obras. Dicen que acaban las obras en 2021. 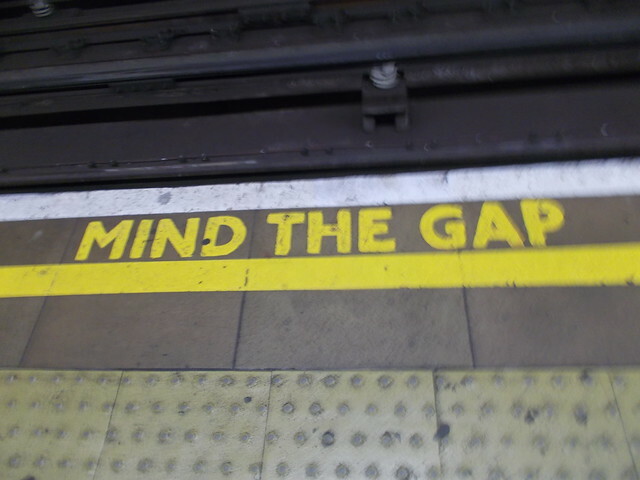 We caught the Tube once more to head to Tower of London and Tower Bridge. 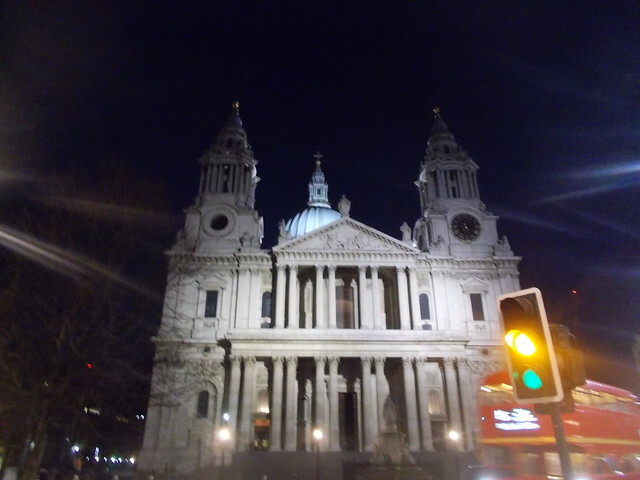 After crossing the most famous bridge of London, we headed toward St. Paul’s Cathedral and arrived just after sunset. It was then time for the hotel and dinner. Cogemos el metro una vez más para ir al Torre de Londres y el Puente Torre (Tower of London y Tower Bridge). Después de cruzar el puente más conocido de Londres, fuimos a la catedral de San Pablo y llegamos justo después de atardecer. Después tocaba ir al hotel y la cena. Monday morning we woke up to SNOW! I was so excited to see the falling flakes. 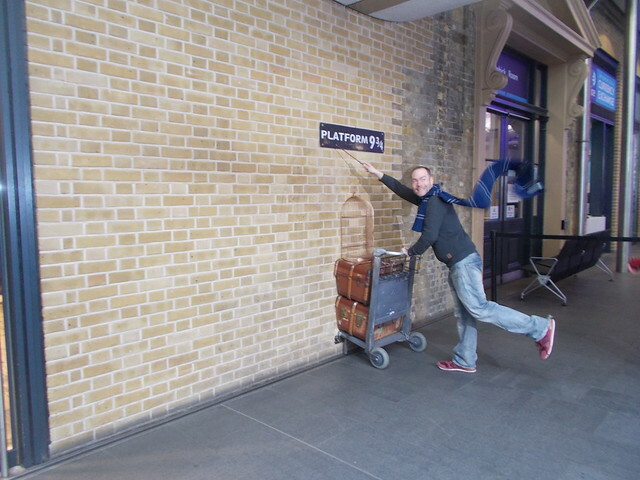 We headed to King’s Cross Station to catch the Hogwart’s Express. Unfortunately, the snow must have cancelled it, or since I am regrettably a Muggle, Platform 9 3/4 just did not transport me to the train. Bugger. El lunes por la mañana, nos despertamos para ver ¡NIEVE! Me emocionó ver las copas de nieve cayendo. Después fuimos a la estación de Kings Cross para coger el Hogwart Exprés. Lamentablemente, la nieve causó una cancelación, o, porque soy un Muggle, la Plataforma 9 3/4 no me llevó hasta el tren. Collons. 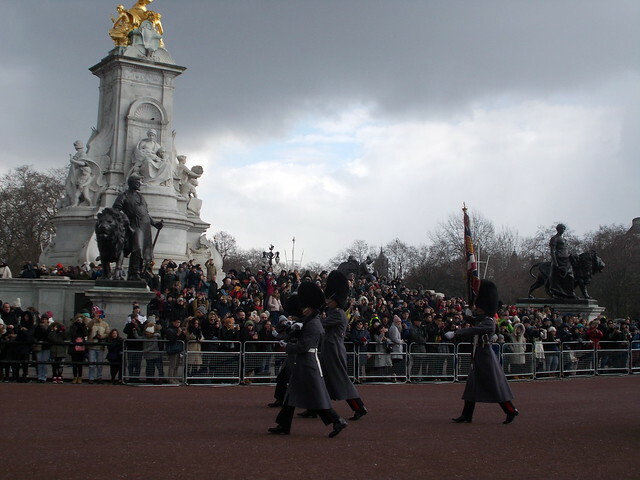 Next on the list was Hyde Park and the Changing of the Guard at Buckingham Palace. I’m glad I had seen it in 2000 as we arrived a bit late (only in Great Britain is arriving 45 minutes early a bit late) to be able to grab a good view point. 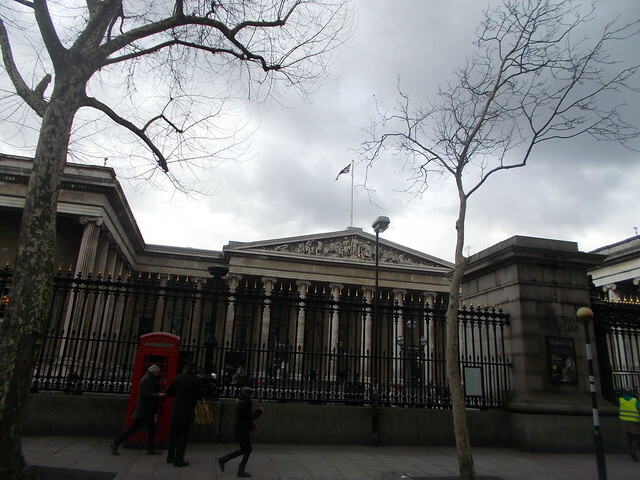 The snow pelted us on our walk to the Underground to go to the National Science Museum. 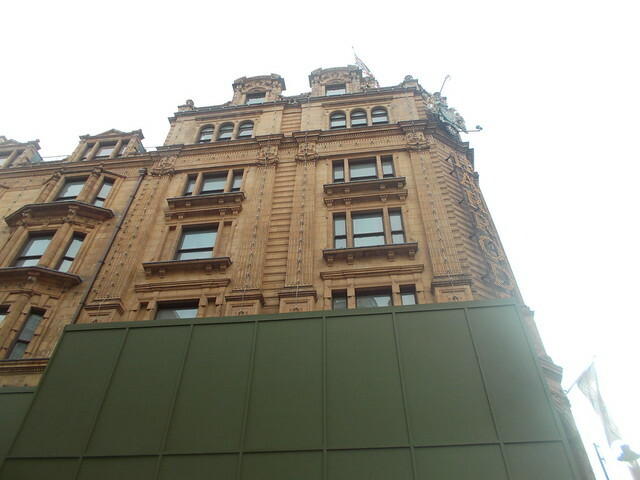 From there we went to Harrod’s where there was free time to eat and shop. La próxima parada fue Hyde Park y el Cambio de la Guardia en el Palacio Buckingham. Me alegro haber visto la ceremonia en 2000 como llegamos tarde para encontrar un sitio con buenas vistas (solo en la Gran Bretaña es llegar 45 minutos antes “tarde”). La nieve nos golpeó durante el camino hasta el metro para ir al National Science Museum (Museo de Ciencia Nacional). Desde allí fuimos a Harrod’s donde había tiempo libre para comer y ir de compras. 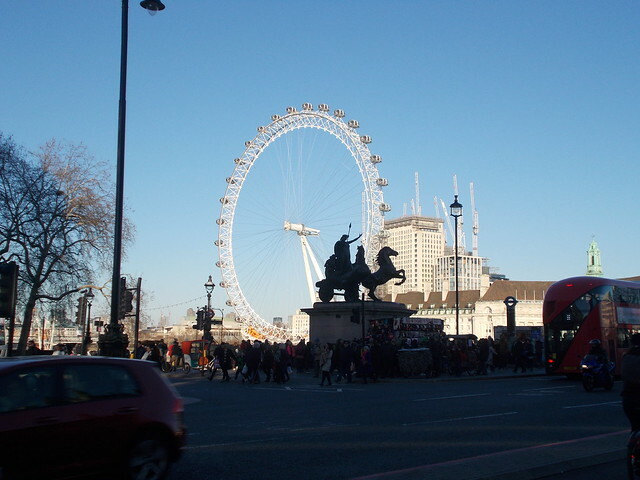 After the department store Harrod’s came Oxford Street shopping, the Marble Arch, Abbey Road and Baker Street. Después de el gran almacén Harrods, fuimos de compras en Oxford Street, el Marble Arch, Abbey Road y Baker Street. 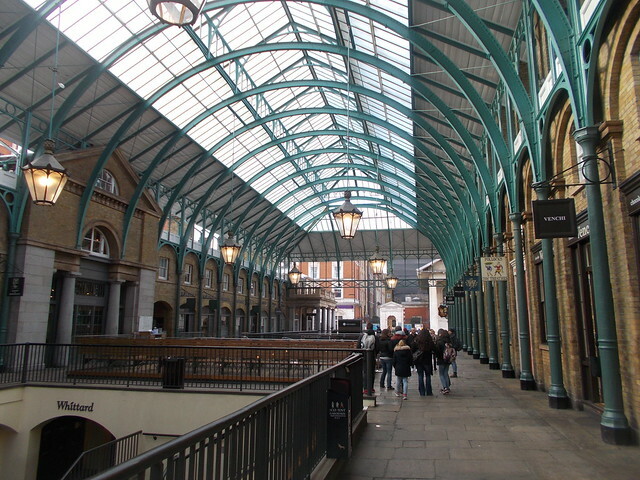 Tuesday morning, our last morning, we checked out and walked to Covent Garden where we waited for the shops to open. 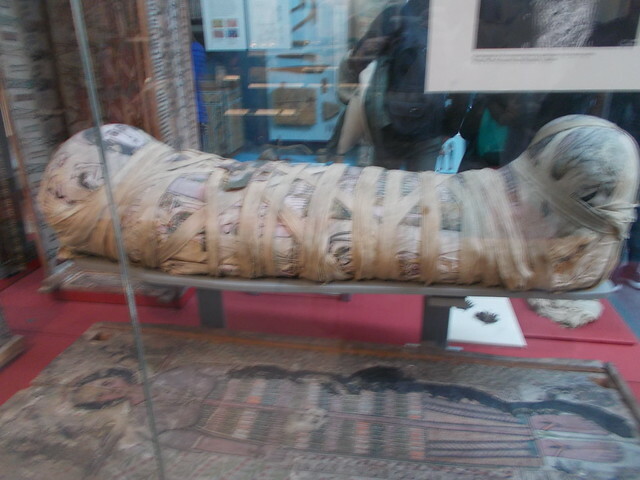 After that was a stop at the British Museum. I had coincidentally just completed Anne Rice’s The Mummy, or Ramses the Damned, which talks about the British Museum at length due to the Egyptian collection. El martes por la mañana, nuestra última mañana del viaje, hicimos check-out y caminamos a Covent Garden donde esperamos hasta las tiendes abrieron. 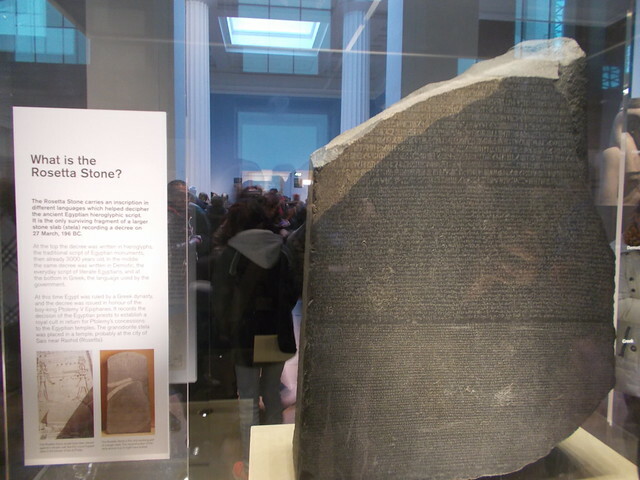 Después, fuimos al British Museum (Museo Británico). Por casualidad estaba leyendo The Mummy, or Ramses the Damned de Anne Rice, que habla mucho del museo dado a su colección de Egipto. 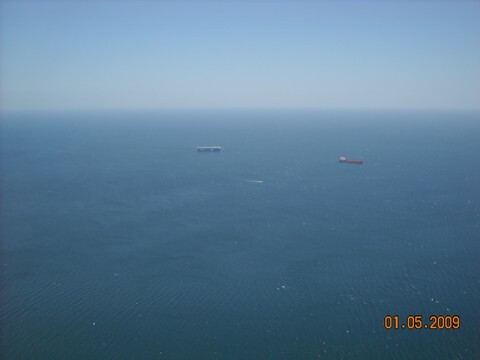 We flew back to València from London-Gatwick. Volvímos a València por London-Gatwick. It was a whirlwind trip and we saw a lot. I think the students had fun, and all of us arrived back to València exhausted. 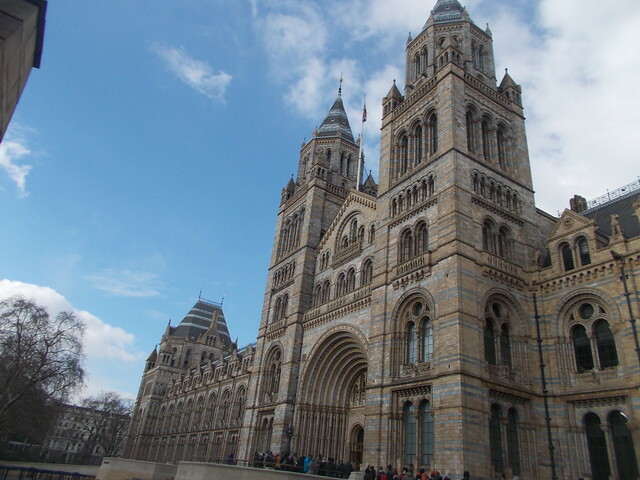 I feel that with London, most of the tourist sites are known by all. 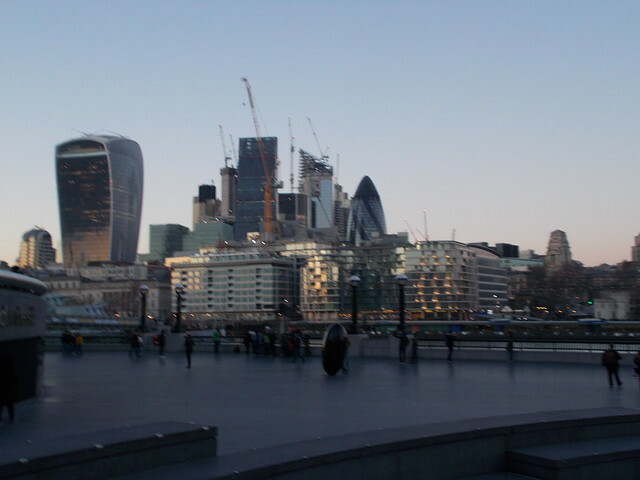 Nevertheless, I will write a SetMeravelles of London to talk about seven places that are special to me in the English capital. Era un viaje de prisa y vimos mucho. Creo que los alumnos lo han pasado bien, y todos llegamos a València agotados. Creo que con Londres, todo el mundo ya conoce algo de los sitios turísticos. Sin embargo, voy a escribir un SetMeravelles de Londres para hablar de sitios sitios que son especiales para mi en la capital de los guiris. You’ve been warned! ¡Ya os he avisado!